Zackmans Journey: Who's reflection is in the mirror? Who's reflection is in the mirror? Should our moods be a reflection of others? If someone we love is having a bad day, do we in turn need to honor their feelings by also being in a bad mood? How far should our empathy go. These are questions that are difficult even under normal circumstances, but when you have a husband who has been sick for days and a son who is "done" with everything he is going through, is it fair to feel good about your day? Is it fair to run around and be happy and enjoy a beautiful day when they are not in a position to do so? I play cheerleader so often, when "they" don't respond it is so hard to know what the next step is. I must learn to give them space and make sure they know I am here when and if they are in need, that's all I'm sure about. I woke up yesterday morning refreshed after a very good night's sleep. Frank slept on the couch and at 7:45 am was still sound asleep (very unusual for him). His fever has yet to break and we are discovering from others that have had the same illness that it is viral, so antibiotics will not help. He is constantly aching and has eaten very little. Zack spent the night at Chris F.' s house so I'm sure he had a good time, maybe not so much sleep, they are teenagers after all. I call him around 10 am on my way to Mom's booth to do some more touch ups. He is still half asleep and grumpy. Of course he gets angry when I ask if he's had his morning shot. This is a routine, twice a day. I ask, he says yes with anger and frustration in his voice. He hates the shots, they hurt and though he understands the severity of why he needs them, he is still so over it! I make it to Moms Booth (where she sells her one of a kind hand made jewelry as well as vintage costume pieces) where they are in the middle of a Holiday Open House. There are cookies, cider, treats all over the place. Everyone is milling around and the booths are full of decorations. It feels good to be out there again, something different and constructive for me to do. I put out signs with 20% off in Moms booth and then "shop" around a little. Once finished I decide it's time to head over to Shawn and Floyd's house. 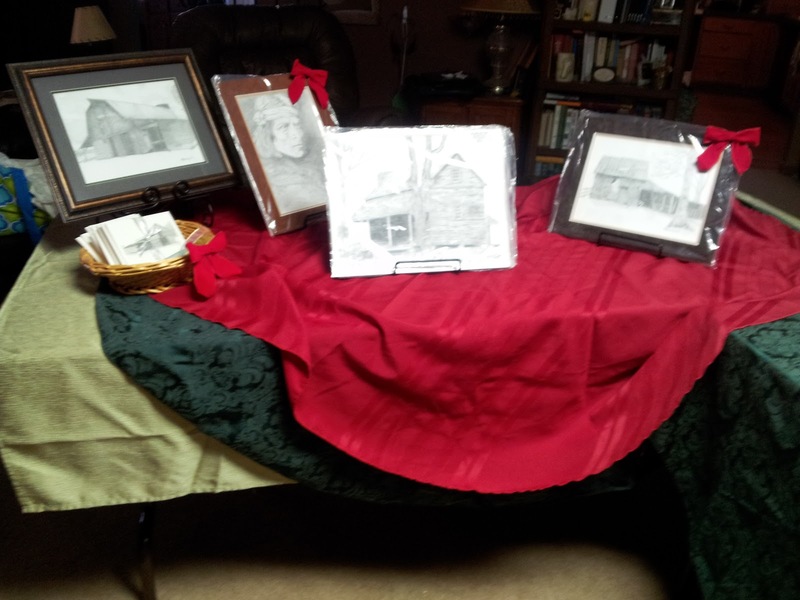 My sister in law is showing her drawings at a show next Saturday and she asked if I could help her with the display. Having done this for years with Mom and Dad, how could I say no? Another chance to be creative and share my talent. The three of us had a nice lunch together, catching up and set up the display. When everything was set up I decided to head to Hendersonville to see Mom. Zack was still with his friends and Frank still sick, so I really didn't want to be at home hiding out in the bedroom. Mom and I had a nice dinner at Outback , grabbed dinner for Bob (brother) and Frank and once I dropped her back home, I headed to my home, feeling a sense of accomplishment for the day. I helped out where I was needed and had a good time as well. When I arrived home, Zack was there early. He was in a very bad mood and didn't want to talk about anything. He simply said he was going to bed. Frank was still on the couch feeling achy and feverish. I tried to get Zack to talk to me, but when he is in this bad of a mood I give him his space and let him know where I am should he decide he is ready to talk. I say good night and am in bed by 8 pm. I realize as I'm typing the blog that I fall asleep with my hands on the laptop. I guess I was more tired than I realized. It is Sunday morning and after yet another night on the couch, Frank still wakes up aching and with a low grade fever. He decides to take a hot bath to see if the fever will break with no luck. He tells me that he will go to Urgent care tomorrow if he is not better. He knows that there is probably nothing they can do, but we decide he must do something. Zack is in a better frame of mind, he shares after much prompting, that he is so pissed he has "two days until Hell!" I remind him that we may not go into the hospital. he says "Mom, with my luck I'm sure they'll do what they did last month, put my in for six days instead of five." What can I say? I have to agree with him and he has every right to feel this way. Our new routine until Frank is better is to wear surgical masks. It's kind of funny to see us all wearing these in the house, but it is (hopefully) going to keep us all safe. My anxiety levels are through the roof. I can't get sick, Zack certainly can't , so we do everything we can to stay healthy. I start the laundry and vacuuming of the house. I sterilize the bathrooms, door knobs, etc..... the routine continues of sterilization in the house. That is the most control I have to keep this at bay. Zack stays in his room and looks up more trucks for sale, his mood is better, though he isn't quite himself. I'm sure he will be thinking about the coming week, until we know on Tuesday what the week has in store for us. Frank is sitting outside on the patio, the weather is beautiful today so he wants to get as much fresh air as possible. After awhile Zack asks to go and hang out with his friends. Frank is frustrated because Zack keeps leaving, he feels he should help around the house and work on his schoolwork. Though I agree with him, I would rather him be out of the house away from any possible threat of catching anything, once I explain that to Frank he is more understanding. I also assure him that Zack will not be going anywhere next week until his schoolwork is current. This has become and unfortunate theme for us these days. I run out to the store to get more sterilization products and folders to keep all the medical bills and EOB's (Explanation of Benefits) from the insurance company in order. The bills are coming from so many directions I must have them in some semblance of order. When I return home, I fix some chicken soup for Frank with the hopes that he will be able to eat it all. He does seem to be getting better, but now he is pretty weak. Zack comes in to tell us he is going up to Chris' house for a bonfire (or firepit). We instruct him to be back home by 9 pm which is his driving restriction. I again am staying in the bedroom and finishing up the laundry, playing my games on FB and attempting to finish the blog before I fall asleep at the laptop again. I am learning more and more that I have little or no control over anything these days. Perhaps I never have had control (even when I fooled myself into thinking I did). I am learning that change is inevitable and I can either fight it or go with it. I'm too tired to fight anything right now except taking care of my"men". Oh.. and myself (I will get fussed at if I didn't mention that one!!). As I keep up with Face Book friends and acquaintances I follow a young mother and wife who's husband is battling his fifth time with this horrible disease. First diagnosed at age 13 in the spine, I try not to compare, but the fear is always there. He just finished another surgery where they thought the tumor was benign only to find it was Ewings.. again!! His case is different, but we have a kinship. We know what this feels like, we know the fear, the lack of control, the journey and the renewed strength we must find each and every day. "Mom, will my eyes stay this way?" The long and short of it! Follow the yellow brick road.. Among my blessings, I count YOU!!! "Mom, You talk too much!!!" Mom, I bought the bumble bee!!! "No trash in my truck Mom"
All material in this blog remains the property of Sabrina G. Kensinger and is subject to Copyright . Picture Window theme. Theme images by Nikada. Powered by Blogger.